Adrift at sea? A bad place to be. The 23-year-old Tami (Shailene Woodley), is an adventurer at heart. She’s left her San Diego home in an effort to explore the world, yet she doesn’t know how. Huge ambitions, but no waypoint to follow. That all changes when she’s introduced to Richard (Sam Claflin), an older man who also enjoys traveling via his self-made boat. The duo hit it off immediately, and within months, they’re doing everything together—including taking on a job that sees them sailing a high-priced and fully stocked yacht from Tahiti to Tami’s hometown—for 10K and 30 days of work. Returning to San Diego so soon seems awkward, but also offers an opportunity for Tami to come full circle with things and show her family the great man Richard is. Unfortunately, Mother Nature only cooperates when she wants to, and a Category 5 quickly turns their sweet adventure into a horrific fight for survival. Specific films definitely live or die more on the strength of their cast’s respective performances. Survival films in particular often don’t rely so much on a cast as they do one person to sell the direness of the scenario (see: The Grey and The Shallows for semi-recent examples). They can generally only end in one of two ways, especially if rooted around a true story like Adrift happens to be. When buoyed by a sound lead and a consistent direction, these genre flicks may not be transformative, but they can be perfectly foolproof and set out to do what they intend to. 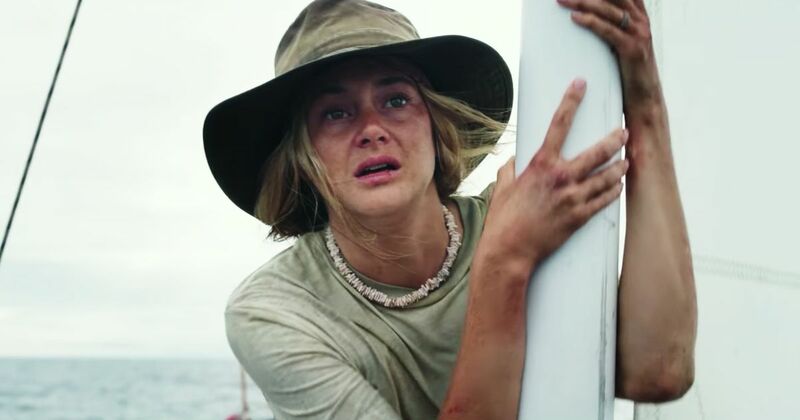 In Adrift, that sound (read: strong) lead performance is courtesy of one Shailene Woodley, essentially playing two people that the audience sees at the same time. The transition that Tami sees from idealistic and overjoyed travel conqueror to nervous and hallucinatory sea victim is substantial. She is the captain of this movie as the runtime sails along, but, she develops sweet chemistry with Claflin. Occasionally, the movie feels little more than an excuse to see two gorgeous individuals finding love. Overall, though, their connection gives Adrift enough of a a foundational emotional component to overcome its surprisingly awkward and cringe-inducing dialogue in spots. As it has been alluded to, there’s only so much that can be done with a survival movie, but writers Aaron and Jordan Kandell along with David Branson Smith do try to mix up the storytelling structure. How do they go about it? By starting in media res and fleshing out the backstory as Adrift goes along. No, this doesn’t change the ultimate destination, but, it does allow for some mystery and the opportunity for the emotional links to solidify for those unfamiliar with the true story (i.e. myself). Framing in this style actually allows the pacing to be consistent and prevents it from dropping off like it could have if the bulk of the move were just a survival at sea episode 30 minutes in. With one of his recent directorial efforts being Everest, it would appear that director Baltasar Kormákur might have an affinity for delving into the human instinct of survival. 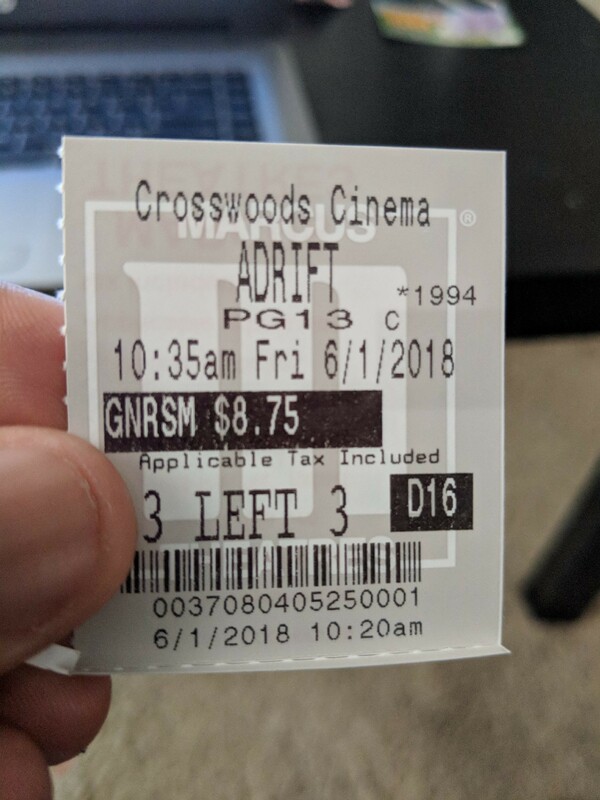 Unlike Everest, a good—if somewhat unfocused—disaster movie that saw the mountain overshadowing all of its characters, Adrift benefits from a reduced scope. It is kind of crazy to say “reduced” as the ocean is so vast, but this is very much a compact story predominately taking place on a raggedy boat. When it is time for things to get destructive. however, Kormákur shows his flair for the devastation, staging an impressive sequence midway through that is extremely harrowing. Anchored by a steady Woodley, Adrift navigates familiar waters and headwinds but comes out of them upright and intact. A perfectly fine genre movie, no capsizing here. Photo credits go to pastemagazine.com, cosmopolitian.com, and eonline.com.